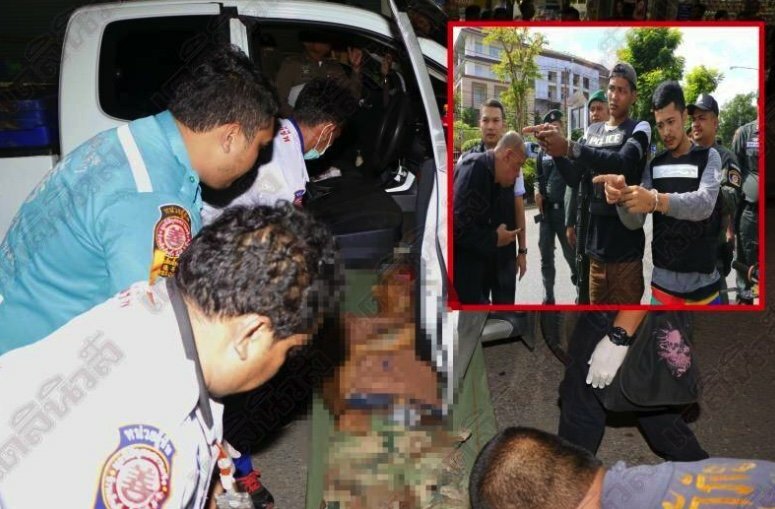 Two 21 year old Thai men have admitted murder after they shot a driver who cut in front of the motorcycle they were riding in Trang in Thailand's south. Thirty officers took Withaya Krungchukaew and Suthee Phosanga on a reenactment to the scene outside the Rak Thai Mini Mart opposite the downtown tech college. The young men from Khuan Pring sub-district said that on May 29th Kornwit Suwantho,26, had repeatedly cut in front of the Honda bike they were riding. In anger they pulled out a .357 gun and shot him twice in the eyes as he was still sitting in his Isuzu pick up. Both men had previous offences for armed robbery and drugs and had been in and out of jail. Suthee had only recently been released. They have been charged with murder. Appears the death penalty is the only way to deal with these 2 ! Do it in secret don't want to upset the Do Gooders !!! Perhaps, they could release a couple of FB posters and keep these two in jail longer this time. Murdered outside the Rak Thai Mini Mart, bit ironic that. Some might say they did a service getting a dangerous pickup driver off the road. Well looks like 3 clowns been taken off the roads. Will the pickup driver be classed as a road fatality? These sound like hardened career criminals,lets hope they get a very long stretch in jail. ...in that case it is fate! And another 2 Thais who's ego was bigger than their brains. Have fun spending another 10 years in jail just because someone cut you off in their pickup. I can understand the anger and frustration, but was it really worth it? Ask that question again after a couple of jails rotting in prison. Maybe think about your actions before acting. Terrible for sure but will the one that did the actual shooting get more time or have to do a deeper wai ? Such people deserve to be hanged...they are a constant danger and threat to society....case closed !.....But the truck driver (RIP)....was not doing it totally right either. .So I guess their word, about the pick up, is believable? Maybe they just figured it would help get them a lighter sentence? Seems most accidents are blamed on break problems, or someone cutting in front. Of course these guys are honest, so they wouldnt think of making anything up. Not going to lose any sleep over any of these three. Bulletproof sunglasses can be had on eBay but something tells me these two geniuses were aiming elsewhere. An eye for an eyes seems appropriate recourse for the scum jailbirds/criminals/dregs of society.